Supreme Court and the Voting Rights Act: Goodbye to Section 5. People died to pass Section 5 of the Voting Rights Act, but that didn’t save it at the Supreme Court. 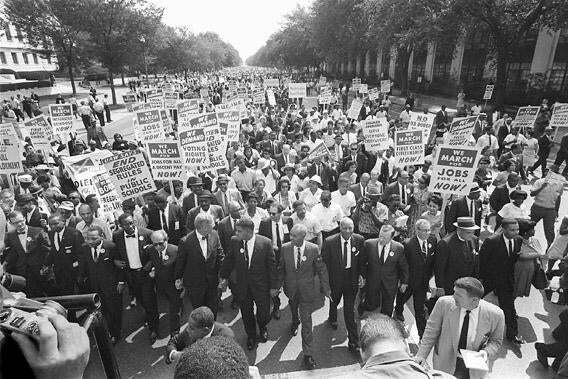 Martin Luther King Jr. and other civil rights leaders march on August 28, 1963 in Washington, D.C. The Supreme Court struck down the crown jewel of the Civil Rights movement today. Section 5 was the most powerful tool in the movement’s arsenal. Although I’m a law professor and thus supposed to be opining on the court’s decision and Congress’ potential response, I want to spend a little time mourning Section 5’s passing before hashing out the consequences. To understand why Section 5 was special, you have to know a bit about its history. The brutal attacks on civil rights marchers crossing the Edmund Pettus Bridge provided the push needed to pass the Voting Rights Act. When the Voting Rights Act passed in 1965, almost no African-Americans were registered to vote in the Deep South due to brutal repression and sickening legal chicanery. Civil rights litigators and the Department of Justice were doing their best to help. They filed lawsuit after lawsuit to make it possible for blacks to register. But every time a court deemed one discriminatory practice illegal, local officials would switch to another. Literacy tests, poll taxes, burdensome registration requirements—these techniques were all used to prevent African-Americans from voting. Southern voting registrars would even resign from their positions as soon as a lawsuit was on the cusp of succeeding, thereby sending the case back to square one. The Voting Rights Act aimed to change all of this. Section 5 was the most important and imaginative provision in the law. It required certain states and jurisdictions, mostly in the South, to ask the federal government’s permission before making any change—no matter how small—in the way they run elections. Until a rule was “precleared,” it could not go into effect. This unusual provision solved the central problem of voting-rights enforcement during the civil rights era—keeping up with the increasingly creative strategies recalcitrant state and local governments used to disenfranchise voters. Section 5 shifted the burden of inertia, allowing the Department of Justice to get one step ahead of local officials. It worked. It worked miraculously well, in fact. In a remarkably short period, African-American registration rates shot up. Section 5 mattered especially for the Deep South, where there were large concentrations of black voters. By the 1990s, these states were able to send a historic number of black representatives to Congress. But Section 5 didn’t just matter for the big-ticket races. For decades it provided strong protections for minority voters in local and state elections as well as federal ones. Based on those successes, Congress renewed Section 4’s “coverage formula”—the provision that determines which jurisdictions have to preclear changes and which don’t—again and again. The last renewal in 2006 finally proved to be too much for the five conservative justices. Today’s opinion rebukes Congress for relying on 40-year-old data. Put more simply, the court took Congress to task for its failure to recognize that the South is no longer the South. Chief Justice John Roberts, writing for the five-justice majority, insisted that the principles of federalism forbid Congress to require some states, and not others, to get pre-approval for potentially discriminatory election changes. Roberts left open the possibility that Congress could make a different record and start over, thereby bringing Section 5 to life again. Almost no one thinks that’s going to happen. Section 5 is dead. Congress may or may not pass something in its place, but it will look nothing like what existed at 9:59 this morning, before the Court handed down its opinion. And part of me just wants to mourn that fact. That might seem like an odd notion given that experts have long known that Section 5 was on its last legs. The process has been so drawn out, in fact, that it feels as if everything that can be said about Section 5’s demise has already been said. Every election law professor has had cynical discussions about whether Section 5 still matters. We’ve all offered learned opinions on the likelihood of future legislation and what shape it should take. But still. Although we all knew this was coming, it nonetheless feels like a bit of a shock. Because Section 5 was special. No one—not even the majority today—denied that fact. It feels strange to treat this like any other Supreme Court decision. If this were the usual case, I would be telling you that Section 5 was important for this and not that, that the court has to be right that the 1960s coverage formula couldn’t last forever, that Congress should have done more to fix what everyone knew would be a sticking point with the court. I would be giving you concrete examples of where Section 5’s absence will matter going forward. (The Texas attorney general would have beaten me to the punch by announcing two hours after the ruling was handed down that its voter ID law, blocked last year by Section 5, will go into effect immediately.) If this were the usual case, it wouldn’t bother me that this issue will be pushed off the front page tomorrow by the next round of Supreme Court blockbusters. But for now—for just one moment—a bit of simple mourning is in order. I don’t want to end this column with a punch line or a what-comes-next paragraph. It seems disrespectful, somehow. People fought and died for this one. It made a difference—a huge difference—in the lives of a lot of people. That’s reason enough to mourn its passing.